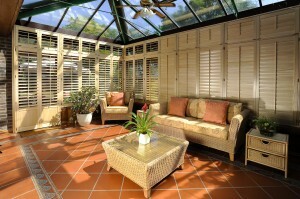 Completing your conservatory or garden room is an exciting and important part of the project. To help create the style and atmosphere you hope to achieve you will need to consider how you want to use your new room space. Functionality and form are of the utmost importance. There are two routes you can take. The first is to treat the room as an extension of your home and to continue the genre of the rest of your property, simply allowing the same style to flow through. The second option is to treat it as a separate room, one which is possibly a little more contemporary than others, affording you the opportunity to create a more casual or cutting edge look. Good quality curtains or blinds can help retain up to 30% of your room’s heat, not only are they effective thermal insulators they will prevent glare and can diffuse the light achieving the atmosphere you wish to create whilst adding some additional protection to your furniture. Manufacturers have worked hard on reducing heat loss and radiation and have some great products available. Roller, vertical and pleated blinds with insulation properties and control of solar heat by reflection keep your conservatory cool in the summer whilst maintaining warmth and comfort in the winter. Blinds have the additional advantage of giving us excellent command of the amount of light entering a room. A great benefit of pleated blinds is they can be manufactured to fit any shape of window so are ideal as roof blinds as well. Great advances in technology mean that we no longer have to stand on a chair with a pole trying to open or close our roof blinds as motorisation of most blinds is available. A relatively new innovation called Perfect Fit blinds benefit from being fixed in a frame on the window, decreasing the amount of light and radiation seepage. They offer a seamless look which is clean cut and neat. One of the earliest forms of window dressing, this is a superb product to help assist with light control and enhance any interior setting. The options for woods and colour painted finishes are extensive. 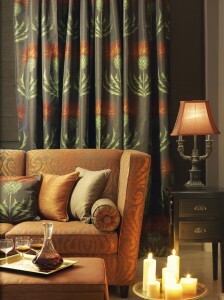 They can help you achieve any look you wish from contemporary right through to traditional. Once you have an idea as to how you would like to use this space its best to enlist the help of an expert. At Drapemasters we offer free advice on all these products as well as a full interior design service. We will come out and measure your windows, show you samples and recommend the best solution for your situation following through with flawless fitting, safeguarding all manufacturers’ warranties. 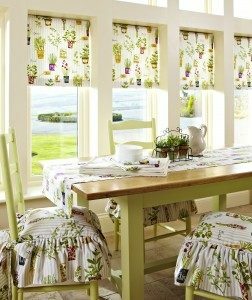 We will ensure your window dressings realise their full beauty and potential allowing you to sit back and enjoy the atmosphere created by them. Light Control A perfect solution for controlling light, they can be fully opened and folded back or when closed the louvres can be angled according to the sun’s position. You can even choose the option of operating the top half independently from the bottom. Versatility Many properties particularly period homes have beautiful feature windows which although look gorgeous can be tricky in terms of shapes and sizes. Opting for bespoke shutters enables you to have them made to fit windows of almost any shape or size and is a great way to accentuate, flatter and focus on these lovely features. By using Drapemasters, your local shutter specialists you can be assured of the highest manufacture, quality and service. We are professionally trained and experienced to assist you at every step of the process, from choosing the right colours from our on-trend palette, to deciding the best configuration for your window, following through with perfect fitting and fully upheld guarantees. 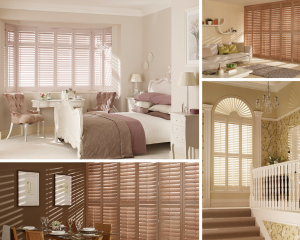 Should you not be looking for shutters, we also offer an amazing range of wood slat venetians and many other soft furnishing services including curtains, blinds, pelmets and upholstery, made up in our own workrooms. As of Boxing Day we will be offering 20% off shutter orders placed between Boxing Day and Valentines Day.